Hi again! If you’ve been able to accomplish the first one, and you’re aim to continue, thi is the second part. In this part, we’re going to run the TestCpp project of Cocos2dx in Android. It’s going to be shorter process than the previous one. Before we start with the Android part, I want you to try to make a debug against the HelloCpp project in eclipse. In Debian I had a problem. My eclipse said “Error while launching command: gdb –version”. After a while I realized that I hadn’t installed it, http://www.gnu.org/software/gdb/ and it’s necessary for debugging, so sudo apt-get install gdb. Let’s start with Android. We have to define a couple of enviroment variables inside our eclipse. The first one, COCOS2DX must be defined in Eclipse->Preferences->General->Workspace->Linked Resources. Click in the New button and set the variable to the path of the uncompress folder of Cocos2dx, in my case /home/borja/Programas/cocos2d-x-2.1.4. 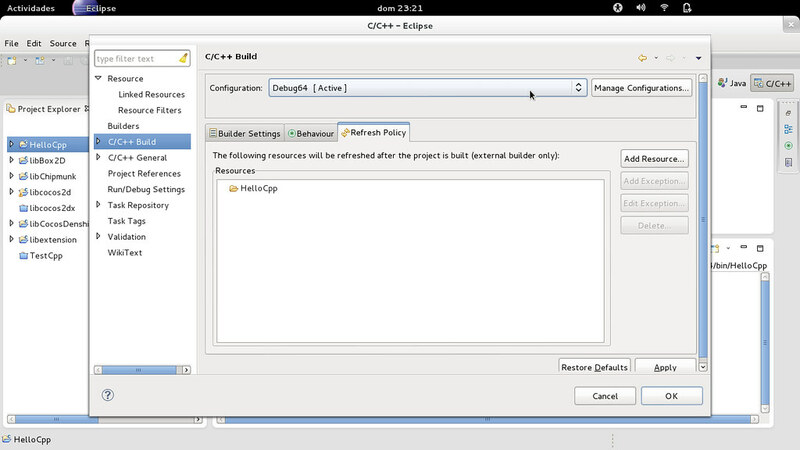 The second one, NDK_ROOT, must be defined in Eclipse->Preferences->C/C++->Build->Environment. Click in Add and set the variable value to the path of the uncompress folder of NDK, in my case /home/borja/Programas/android-ndk-r8e. If you’re compiling the TestCpp project with the last version of Android like me, maybe the NDK shows this error android-ndk-r8e/build/core/add-application.mk:128: Android NDK: WARNING: APP_PLATFORM android-14 is larger than android:minSdkVersion 8 in ./AndroidManifest.xml. You can work around it by modify the file add_application.mk in the line 128, changing $(call __ndk_warning by $(call __ndk_info. Now, try to compile the TestCpp project, you should get an output console like this, but a little much longer :-). Once the building process has finished, launch the app normally in an Android device, and everything should work well. Thanks for read this. The new group of post that I’m going to write, will be about setup a continuous integration environment in general and for Android particulary. Now for making the change effective we have to execute the following command: source .bashrc. The first thing that we’re going to do is install the eclipse plugin for C/C++, the Eclipse CDT Plugin, we have two different ways for doing that. The first one, is looking for it in the Eclipse Marketplace via “Help > Eclipse Marketplace..”, the second one is using the update site: http://download.eclipse.org/tools/cdt/releases/juno. After this, we’re going to download the last version of Cocos2dx from the official site (http://www.cocos2d-x.org/projects/cocos2d-x/wiki/Download), in our case the version 2.1.4, and the last version of the Android NDK (http://developer.android.com/tools/sdk/ndk/index.html), unzip both files in a directory of our choice, in my case the “Programas” directory. Now we have to define a few environment variables by editing the .bashrc file again nano .bashrc. Again, for making the change effective we have to execute the following command: source .bashrc. You must be sure that you have installed the Java JDK because we’re going to need it later. If you don’t have it installed, use the command sudo apt-get install openjdk-6-jdk. If you have already installed a Java JRE, check your version with java -version, in my case I had the 6, so I installed the correspondednt JDK. Now the fun part begins. We’re going to install the necesary dependences to use Cocos2dx. If you have not installed it yet, you’ll have to install the build essentials and the ia32-libs packages, check my previous post. Now we launch the scrpit “make-all-linux-project.sh”, in the root directory of the Cocos2dx uncompressed files: sudo bash make-all-linux-project.sh. When the process finished, we’ll check if everything went ok, so we have to go to the “cocos2d-x-2.1.4/samples/Cpp/HelloCpp/proj.linux/bin/release” directory and execute the HelloCpp: ./HelloCpp. If you see a window with the Cocos2dx logo and the “Hello World” text, we can proudly follow with the next step. It seems a pretty obvious list, but took me a good while to figure out which projects I needed. But what really was a real waste of time was my ignorance about the CDT plugin. I have a 64bits Linux distribution, because of this when I compiled the projects by command line I didn’t get any errors. But when I used eclipse, all projects had problems with the dependencies. After reviewing all the compilation scripts used by the “make-all-linux-project.sh” and putting one by one all the correct dependencies to compile the projects in eclipse, I found out that every C++ project had a 64bits configuration ready to be used in eclipse, it could be selected in the project properties. I show you in these images the steps to follow, if your operating system is 64-bit based. Let’s build the projects in the previous list order, and I’ll explain the details that we found along the process. We build libBox2D without problems. We build libChipmunk without problems. In the libcocos2d library we found the first little issue, there is a dependency error with an static library, libxml2.a. This problem has a quick solution. In the project properties C/C++ Build > Settings. In GCC C++ Compiler > Includes and GCC C Compiler > Includes remove the following library dependence: ../../../cocos2dx/platform/third_party/linux/libxml2. 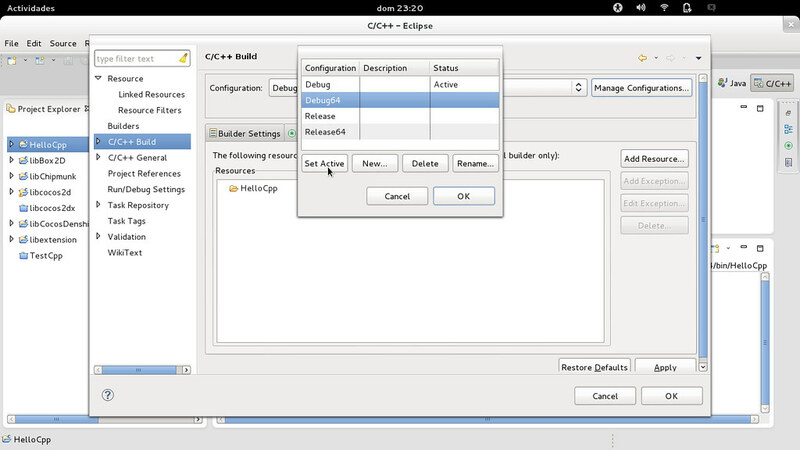 And in GCC C++ Linker > Miscellaneous remove ../../../cocos2dx/platform/third_party/linux/libraries/lib64/libxml2.a. I’ve already make a pull request fixing that https://github.com/cocos2d/cocos2d-x/pull/3019. In the libextension project we found a few issues too :-). At this point, I recognize that these problems are new from the last version 2.1.4. There is a new WebSocket entity that needs a non existing library “libwebsockets.h”. In the previous Cocos2dx versions I didn’t get these errors, because of this I did some research for a while. After more than an hour I realize a few things. The first one, this two elements are defined in ccFPSImages.h and ccFPSImages.c. The second one, building the project by command line it worked perfectly, of course, bacause are included in the Makefile. The last one, building the project by eclipse it didn’t work bacause the generated libcocos2d.so library didn’t cotains this two elements. Well, I think that’s enough for the first part of the tutorial :-). In the second one, we are going to run the TestCpp Android project in a real device. Thanks for reading this long post.